The Challenge Spartan 185 table-top paper cutter provides an economical solution for low to high volume industrial cutting environments, professional offices, copy centers, in plant printers, and on demand print providers. Capitalizing on Challenge's time-proven expertise in manufacturing paper cutters, the Spartan 185 is engaged and manufactured to the highest of safety standards available. With automatic power clamping of 3,000 lbs of force, it ensures all cuts are accurate and smooth. 3 inch lighted LCD display provides a much easier and simple operation with a great presentation. Memory program with 20 programs and 20 cuts in each program will cater to any and all cutting needs. Invest in a heavyweight and durable paper cutter and create the efficient work environment you always desire. 3" Lighted LCD Display: Displays backguague location with +/-0.01" (+/-0.1mm) backgauge accuracy - provides for easier operator interface, higher productivity, and easier repeatable accuracy than a hard to read indicator on a scale as is used with other brands. Programmable: Operator friendly software uses soft key menu prompts for easy programming. During a program the 3" LCD displays up to 5 consecutive cuts to aid the operator in navigating a job. Automatic Pushout Safety Feature: Backgauge automatically pushes stock out from under the clamping area before moving to a longer cut dimension. Laser Red LED Cut Line Light: produces a bright easy to see cut line. Safe: two-hand push button controls and front and rear table safety shields. Auto-Releasing Front Safety Shield: automatically pops open after each cut cycle is completed. This unique benefit eliminates the need for the operator to manually lift the front shield in order to retrieve or adjust the stock after a cut providing increased productivity and operator ease-of-use. Durable: Heavy-Duty steel, cast iron, and cast aluminum construction gives the cutter "Challenge" durability. Maintenance Free: the LED cut-line light and UHMW Gibs result in the SPARTAN 185 being virtually maintenance-free with lifetime durability. UHMW Gibs on front and back of knife bar require zero maintenance and have lifetime durability. It also eliminates lubricant on knife bar that can spoil stock. Included: 1 stand, 2 high speed steel knives, 3 plastic cutting sticks, 1 jogging aid, 1 tool kit, 1 operations manual, and 1 knife change safety holder assembly. Quick-print and on-demand workflows create bottlenecks at many companies. The Spartan 185 allows you to process these jobs and continue meeting your clients demands on-time. The Spartan 185-series guillotines offer many time -saving features not available in other competitive products. All three Spartan 185 models benefit from the following standard features. The Spartna 185 utilizes floating fingers to prevent paper from being trapped beneath the backguage. Exclusive maintenance-free knife bar gibs are highly wear-resistant. The Spartan 185 utilizes a bright-red LED cutting line light. External knife height adjustment is easy to perform. The Spartan 185 encloses the rear table for operator safety. The Spartan 185 is available in three configurations to suit your trimming needs. The Spartan 185 SA features a manual clamp and manual backgauge positioning. The manual clamp provides ample force for consistent product trimming. 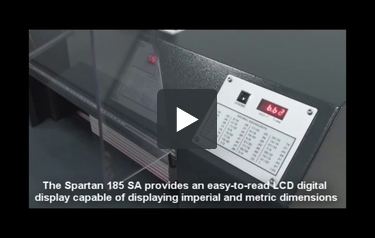 The Spartan 185 SA provides and easy-to-read LCD digital display capable of displaying imperial and metric dimensions. The digital handwheel on the Spartan 185 AEP allows simple maneuvering of the backgauge. The Spartan 185 AEP swiftly and accurately relocates the backgauge for increase productivity. The Spartan 185 AEP provides intuitive job programming and machine diagnostics for even the most novice user. The Spartan 185 provides features that allows you to become more productive. A multitude of safety features reduce injury potential, Auto-releasing tilt-shield very low-maintenance design Integrated locking casters. The Spartan 185 series of guillotines continue our heritage of providing assurance you made the right decision! The Spartan 185 series of guillotines continue our heritage of providing assurance you made the right decision! Challenge Spartan is a good name to look for when selecting an electric paper cutter thanks to devices such as their 185AEP Automatic Electronic Programmable Paper Cutter. We took a look at this machine to see what special features it has and how it rates on a scale of 1 to 10. Here's what we found out. The 185AEP can cut up to 3 inches of paper at once, which is more than 500 sheets. There's 500 sheets of paper in a ream, so essentially you're going to be able to slice through an entire ream plus some extra sheets in just a few seconds. This device can cut paper that's up to 18.5" wide, so you'll be able to work with a lot of different sizes of paper. There's ample space in both in front of and behind the blade, so you'll have a lot of work room. The 185AEP has an electric clamp that can provide over 3,000 pounds of pressure. This will definitely keep your paper aligned so you end up with an accurate cut. There's also an LED cutting line that glows red so you can see where your sheets will be cut before actually lowering the blade. This machine has a backgauge that's controlled by an electronic console located at the front of the device. There's also a hand-wheel you can use if you want to make minor adjustments. You can also program up to 20 cuts into the machine for your convenience. When you operate this machine, you have to use two hands to control it. This is a good safety feature because it ensures your hands won't come into contact with the blade. Also, both the front and rear tables have safety shields on them for your protection. The front shield will even pop up once trimming is done to help you save time. This cutter is extremely durable because it's been made out of a number of different metals including steel and cast iron. You can expect to be able to use this machine for a number of years without any problem. It comes with a one-year warranty. The 185AEP is a large device that has dimensions of 52.75" (height) x 32.25" (width) x 41" (length). It's pretty heavy as well, weighing in at 700 pounds. Luckily, it comes with a stand that's equipped with casters so it can be moved around. The stand even has a storage shelf. Overall rating: 9. The Challenge Spartan 185AEP is an easy-to-use paper cutter with a terrific cutting capacity. It will help you process hundreds of sheets in seconds so you won't have to spend all day cutting. This machine has some really special features such as the powerful electric clamp and the electronically controlled backgauge. It's also safe to use and it comes with a stand. Overall, this is a great cutter and it can really help you out. Get yours today so you can start cutting.